Since October 28th is the “feast day” of St. Jude Thaddaeus, known as the patron saint of desperate cases or lost causes, I wanted to reflect on “Big” goals. Sometimes those of us who have our sights set on a big goal often feel desperate, like reaching that goal is a lost cause or impossible. Maybe we’re even tempted to just give it up. If you’ve ever felt like that, then read on for motivation when pursuing a goal that seems impossible. If you’re striving for a goal that you think is impossible, the first thing you have to do is look at it differently. Literally, stop what you’re doing, rethink your position on your goal, and start to know that it’s possible. It’s like the word itself. When you look at your goal as “IMPOSSIBLE,” then you become paralyzed and defeated before you’ve even begun. Yet when you change perspective and see the “POSSIBLE” in your goal, your focus will shift and you’ll be able to move on to the next step to achieve your goal. 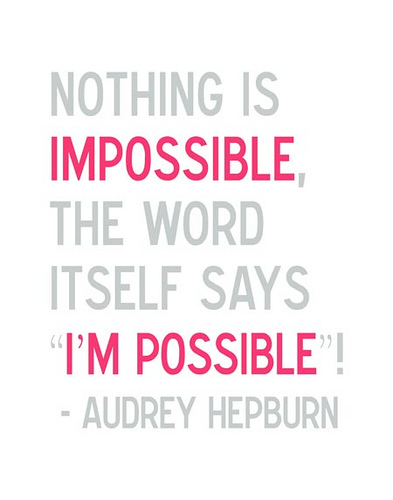 Again, like the word “IMPOSSIBLE”, you need to break your goals down so they become manageable. Broken down, “IMPOSSIBLE”, has an “I”, and “IM”, and “POSSIBLE”. Likewise, your large goal can be broken down into smaller, manageable actions that will lead to accomplishing your goal. For example, let’s say you want to publish a novel. Sure, that may feel impossible if you don’t have a word down on a page. But if you break it down to smaller goals like: 1) write every day until you have X amount of words, 2) Edit the finished manuscript, and 3)Find literary agent, small press, or self-publish, it becomes more manageable. Then you can break it down further and plot small steps you can take toward those goals every day. Don’t think about the ultimate goal as one large leap that needs to be taken over a huge gulf between what you want and what you need (that will tire you out – heck that long sentence tired me out). Instead, map out the practical steps that needed to be accomplished, like throwing out stepping stones, and then tackle one step at a time until you reach your destination. Just because something is possible, doesn’t mean it will be easy. Books like Carrie by Stephen King, Harry Potter by J.K. Rowling, and The Notebook by Nicholas Sparks were rejected multiple times before becoming bestsellers (seriously, where would we be without these books?). Artists like Madonna and U2 were rejected before becoming global superstars. Business moguls like Steve Jobs and Oprah Winfrey were fired from jobs before becoming heads of innovative, successful enterprises. The point is: setbacks will happen; disappointment will be felt; times will seem bleak. But those factors should never stop you from attaining your goal. If anything, setbacks and rejections should fuel the engine and drive you through that last mile. St. Jude became associated with desperate situation because of a letter he wrote. In it he said that you must keep going even in harsh or difficult times. While that may be easier said then done, knowing it is possible to reach your goal; continuing to take the steps necessary to get there; and never giving up even when it gets hard, are sure fire ways to get you where you want to be.